allstaractivist note: These are Sinus CT scans of my head that were ordered by my ENT. I came into his office presenting novel symptoms after having had him perform Sinus Surgery with Balloon Sinuplasty in October of 2014. My novel symptoms of nasal swelling and green expectorate caused him to laugh and exclaim that in thirty years of practice he had never seen this before. Of course I had explained to him earlier before the surgury that my symptoms were due to Gang Stalker poisoning (government experimentation and torture) however, I’m not sure he believed me. Now, all other explanations have been eliminated. So, he is going through a process of elimination (standard diagnostics) to find the cause, I trust him. Miraculously, as soon as I started to see him again the poisoning dramatically curtailed however, I have enough evidence for proof now. The day of the CT scan the Gang Stalkers backed off so that my sinus cavities would not be swollen however, they have other poisons and weapons (military grade DEW weapons) that make you just as sick without so many observable symptoms. They have had time to develop these due to covert and nonconsensual experimentation on the public and soldiers, like me. From this point on I am publishing all of my medical records as they are received. I do this to both establish a baseline (although I’m already sick) as well as show other TI’s methods for exposing government/police sanctioned Gang Stalking criminals. A trail of bread crumbs should I meet an untimely demise. Below are my Sinus CT films and an instructional guide on how to read them. Enjoy! Everyone who has ever had ANY medical test deserves to have at least some understanding of what the test is for and how the results are used. That holds true for sinus x-rays and CT scans. Be sure to read my article on Development of the Sinuses, and also this one about What to Expect When Taking Your Child for Their Sinus CT Scan. Here is a short course in “reading” CT scans of your child’s sinuses. Today I will focus on imaging the sinuses. Computed Tomography (CT) Scans. (I will cover imaging of the neck, and imaging of the ears – along with imaging of the temporal bones, separately at another time). Important consideration: All test results must be interpreted along with the medical history. A CT scan alone does not determine whether a patient has acute sinusitis, chronic sinusitis, or whether they may need surgery. The whole patient must be considered when reviewing the test results. The beauty of CT scans is that they can be artificially “rotated” inside the computer. 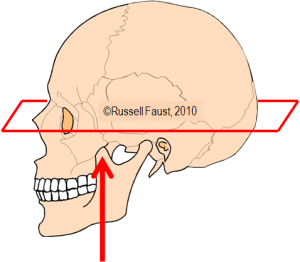 This gives docs the ability to change the angle of the “slices” through the head – the “plane”. Our view is from the front (ARROW). Our view will be looking up at the slice (ARROW). On the drawing above, E denotes Ethmoid Sinuses, and M denotes Maxillary Sinuses. The drawing on the left shows us about where the slice was taken for the CT Scan Image on the right. It goes through the mid or front part of the eye sockets (orbits), ethmoid sinuses, and maxillary sinuses. Compare the CT scan on the right with the drawing of the sinuses and the child’s face just above. On the right, the patient is facing us, their right side is on our left and vice versa. Look toward the right side (the patient’s left sinuses): all of the sinuses are black – full of air. That’s a good thing. 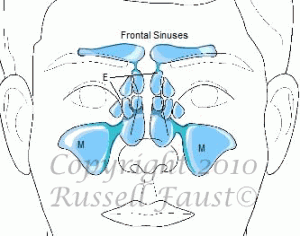 Now look over at the left side (the patient’s right sinuses): there is some gray stuff in the Maxillary Sinus. Can’t tell exactly what that is, but we can speculate, based on years of experience. Some of it is probably secretions – snot. Some of it is probably swelling. That swelling that goes all the way around the sinus suggests chronic inflammation – chronic sinusitis. 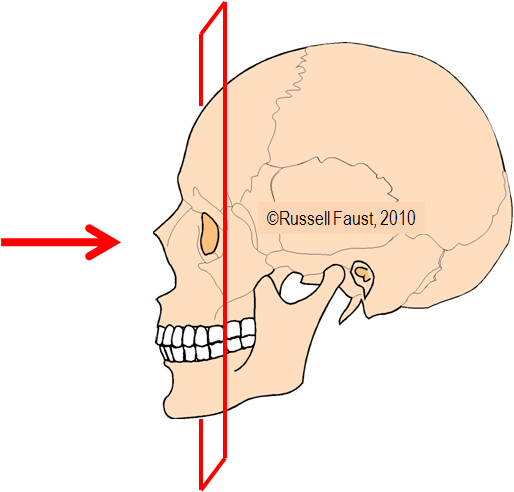 The drawing at the left shows the level of the slice, below the eye sockets, through the level of the maxillary sinuses. The CT Scan on the right shows the maxillary sinuses full of black – air (arrows). These are relatively healthy sinuses. We are looking up at the slice, so the patient’s right is on our left of the image, and vice versa. The drawing at the left shows the level of the slice, through the middle of the eye sockets, higher up than the previous scan. The CT Scan on the right shows the ethmoid sinuses, full of black – air (arrows). Again, these are relatively healthy sinuses. The drawing on the left shows the level of the coronal slice, through the back part of the eye socket. The corresponding CT Scan image on the right shows the ethmoid sinuses, and the maxillary sinuses, nearly full of gray stuff. In this case, these are nasal and sinus polyps. Only the patient’s right maxillary sinus (on the left of the CT scan) shows a small area of air (black). This is severe, advanced polyp disease. This can be seen in children with Cystic Fibrosis. That should provide the basics to help understand your little boogorhead’s Sinus CT scans. At least, when your ENT doc discusses the findings you can keep up now. For the curious, check out some of the previous articles on this blog about Sinus CT scans, listed below in Resources. Please leave a reply or email me with questions or comments! Thanks for visiting! More imaging later: I will cover imaging of the neck, and imaging of the ears (and temporal bones) separately at another time. Over the coming months there will be experts from various areas of medicine here to review the how-and-why of testing. Stay tuned. This entry was posted in Poisoning and tagged CT Imaging, CT Scan of Sinuses, Maxillary Sinus, Maxillary Sinuses, Sinus CT, Sinus CT films, Sinus CT Imaging, Sinus Surgery by Eldon J. Brown. Bookmark the permalink.